When did you last review your estate plan? How long ago did you put in place your estate plan? 5 years? 10 years? Over 10 years? Do you currently have an estate plan in place? · Do your assets still go to who you want? · Are the correct people listed in decision-making roles? · Have your desires changed for who you want to receive your assets? · Have certain decision-makers moved away? · Have minor children now become responsible adults who are ready to serve on your behalf? Secondly, a review can alert you to new laws affecting your estate plan? An example from a few years ago would be the changes regarding access to medical records with the Health Insurance Portability and Accountability Act (HIPAA). A more recent example is the 2017 Tax Cuts and Jobs Act, which changed estate and gift taxation rules. Whether it is the State Legislature or Congress, both organizations continue to pass laws to meet changing circumstances. Staying up-to-date can mean the difference between a plan accomplishing your goals and a plan that causes unneeded problems and headaches. For all our clients, we offer complimentary reviews every 3 years. For clients, it is a chance to review their estate plan to ensure everything is current and there are no major changes requiring updates due to the passage of new laws. For us, it is a chance to talk with clients and ensure their estate plan continues to meet their objectives. If you have not put in place any estate planning documents, you are not alone. In fact, you are in the majority! Shocking numbers indicate that over 50% of people pass away with no estate planning documents in place. https://www.usatoday.com/story/money/personalfinance/2015/07/11/estate-plan-will/71270548/ This often leads to countless hours, disputes, and unnecessary stress on loved ones who are dealing with your passing. Whether you worked with us in the past or wish to work with us in the future, give us a call today or send us an e-mail by clicking here! 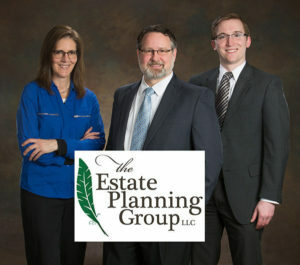 Here at The Estate Planning Group, we are always happy to assist individuals, businesses, and families, plan for a smooth and seamless future!